We’d like to assist you in finding the right drain cleaner. In this article you will learn more about drain cleaners. We have put together a lot of information on drain cleaners that will be help you choose the right method / product if your drain is clogged. Typically a drain cleaner is a consumer product that in most cases i based on chemicals. It is used to unclog drains and help to prevent future blockages of the drain. In this article we will concentrate on the products to directly put in the drain to clean it – not on the devices used to clear clogged drain such as drain snakes. Drain cleaners are usually able to remove soft obstructions from the drain. These might be hair or food-leftovers that are flushed down the drain. There is a huge variety of drain cleaners – which is why we’d like to present you a selection of different products. The first question is what kind of drano you prefer: Are you looking for a chemical solution, or would you rather want to go for an eco-friendly alternative? In order to provide you with results, we have done some research about different drain cleaners and their qualities. Facing the large offer of different drain cleaners, a good thing to do is to divide them into different categories, such as: kind of ingredients, dosing amount etc. Which is exactly what we have done in order to provide you with a product compilation. This is important, as a drain will be unblocked a certain way, depending on the effect the according drain cleaner has (also read our top 10 tips to clear clogged drains). In order to provide you with more than just chemical options, we have put together a selection of drain cleaners from different categories. Take a look at the different drain cleaners and read the according recommendations, depending on whether or not you would like to use chemicals in your slow running drain. We want to start with drain cleaners powered by compressed air and cleaning the drain by air bursts. They us accelerated air to destroy the blockage in the drain. They are creating force on the clog / standing water that is based close to the opening of the drain. The big advantage of this method is that it works immidiately and it is a eco-friendly solution you may want to choose if the chemical solution is too rude. If you are using a drain cleaner working with compressed air / air bursts you have to make sure that all other openings of the sink, bathtub etc are fully closed / covered so that the air does not leak at the wrong end. The disadvantage of air burst drain cleaners is that they only work if there is enough standing water in the drain. Another issue is that they only work on short distance – so if the clog is deeper down the drain you should consider other options. And if you use the method with compressed air you should wear eye protection. Drain cleaners made from granulate consist of different substances. Standard ingredients are alkaline components, nitrate, sodium carbonate and small aluminum beads. Upon contact with water, the cleaner creates a leach, while the aluminum beads start oxidizing. This chemical reaction sets free heat and hydrogen, which breaks up the blockage, causing a pungent odor to emerge. Because: the nitrate turns hydrogen into ammonia, which can cause an unpleasant smell in your drain. Caution: During use, make sure to air the room well and to use the correct amount of cleaner. Using a too large amount of drain cleaner can damage drainpipes made from plastic, or it can agglutinate. Read all instructions to use on the bottle / packaging carefully. Liquid and powder-based drain cleaners work in a similar way as granulated drain cleaners. Please, always make sure to not overdo the dosage of drain cleaners to prevent the pipes from fully clogging up, which might result in having to do a costly professional drain cleaning. If you prefer an eco-friendly alternative, you should give organic / enzymatic drain cleaners a try. These kinds of drain cleaners often times contain enzymes that remove grease and protein. Such enzymes are not harmful to water, but need a much longer application time. With natural drain cleaners, it can take several hours or even longer for them to take effect. You should keep in mind that enzymatic drain cleaners will help to keep the water running in the drain and most of them are not intended to clear severely clogged drains. If this is the case please have a look here. If using the drain cleaning products listed above does not solve your problem, please take a look at our list of hacks, tips and tricks on how to clean a drain. The solution to issues such as a clogged drain, clogged toilet, a blocked shower drain, sink drain or a clogged toilet drain does not necessarily have to be expensive. Whether or not the list of drain cleaners presented above will meet your wishes also depends on the field of application and possible environmental concerns. Because not all cleaners are eco-friendly. Therefore, it is always recommended to consult a professional in a hardware store or an expert of your choice. Also, please always proceed with caution when using drain cleaners, as they can cause severe chemical burns and skin irritations. 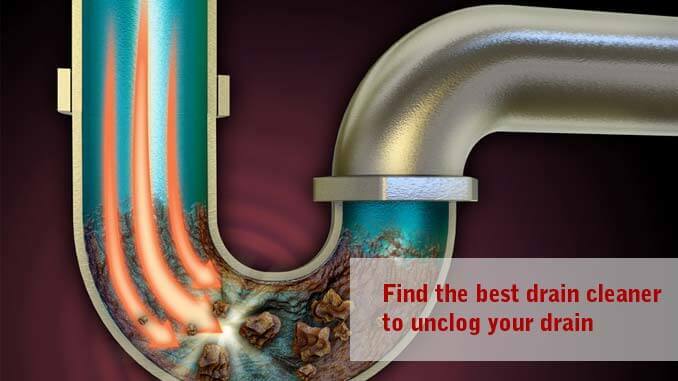 If all of the above does not help – there is always another solution: You may want to call a plumber if you are not able to unclog a drain on your own. We always recommend to ask to your trusted plumber for advice. If you are not sure how to solve this problem yourself it’s always a good idea to get help from a third party. The reason for this is that you may do the wrong thing and the blockage in the drain may get worse. What are your experiences with drain cleaners? Leave a comment and share your thoughts.